Business executives can be intimidating, especially if you’re approaching them with a plan they need to approve — and finance. When it comes to Florida corporate events, follow these tips when pitching an event and you’re sure to have success. An executive wants to hear one main thing: how does your plan align with the organization’s goals? Demonstrate that you have a knowledge of the company. Discuss how your plan relates to member acquisition and retention, increased donations and shareholder value, and brand recognition. Consider your audience. Depending on their position, each executive will have a slightly different set of goals that you need to properly address. Chief Executive Officer: Focus on revenue, new opportunities, and how you’ll be utilizing current trends to attract attendees. Chief Operations Officer: Talk about how your event will improve the day-to-day operations of the organization. Chief Financial Officer: Show the revenue that your event will bring to the organization and how you will work with potential investors. If possible, find data from a similar event to support your claims. Chief Technology and Chief Information Officers: These executives are concerned with enhancing IT resources. Let them know that you value this as well, and explain how your event will help them reach their goals. Chief Marketing Officer: Share how the community’s perception of the organization will better from this event. Talk about increased sales and your value propositions. General Councils: Discuss how you will protect the organization from any legal issues. Highlight the qualified medical team that will be available on site, or quickly summarize the paperwork that vendors will sign. Provide as much hard data as possible. Do your homework, and avoid speculation statistics. Focus on key numbers like potential revenue, headcount, marketing reach, and costs. Nothing says “I came prepared” like a small handout with your value propositions, hard data, and how you intend to meet organizational goals. Make sure to include your contact information. This is important. Not only should your handout be short and brief, but your presentation should be that way as well. It’s not necessary to dive into small details like potential venues, speakers, or food options; this will only get your presentation stuck in a rut. Demonstrate that you respect their time by keeping your pitch under 10 minutes (and prepare for up to 20 minutes of Q&A), but don’t leave until you’ve discussed and settled on the “next steps” with the executive. Pitching to executives can be daunting, but these Florida corporate event tips are sure to help you reach your goals. To find out how we can help your next event, contact us at 407-955-4949. Looking for a fun and engaging way to raise funds at your next party or Florida corporate event? Whether it’s for charity or the company, the experts at Orlando event planning are here to give you ideas to spruce up your next festivity. The items should be self-displayed for guests to see up close and personal. The traffic flow from the silent auction tables and food/drink tables are important. One tip is to have it flow from one to the other in a circle so it keeps bidders from seeing the items more than once. For more added fun, items can be themed to the event. Such as a Great Gatsby themed event with antique glassware on display or a Casino event stocked with a poker set donned with Vegas flair. Or maybe you have a sponsor who can help create custom gift baskets easily to support the auction. Raffle sales are fun, fast, and easy. It’s very important to first check if this type of fundraising is permitted in your local area. 50/50 raffles are one of the most enticing ways to get people to buy tickets because they split the net proceeds with the organization. Sell the tickets for one dollar each or in bundles 12 for $10 and so on. Have them write their name and phone number on the tickets and let them know you’ll contact them via text or call. A live auction is 100% engaging with the audience and creates a fun atmosphere everyone can enjoy. Having a mix of inexpensive and high-value items and showing them one by one draws in the crowd and keeps them. But of course, this type of auction requires manpower for it to run smoothly. Items that have high value, inexpensive, or the organization’s own items. The MC/auctioneer aids in formulating an energetic atmosphere and one that really knows the mission and goals can help drive revenue. Each should sit around the room & have spreadsheets with the bidder’s # and bid to help cross reference when it comes time to determine the final bid. Higher-valued items should have sooner closing time to encourage last-minute bidding. From 20 to 1,000 players, test your guest’s hands at a game of poker. This highly social game is sure to get the energy running. In addition, you must determine the monetary value of chips and provide the option for guests to buy more but also allocate the proceeds to where a certain percentage goes to the winner. If the nature of your event or party is specialized, sell the event itself with tickets. This is the easiest way to generate revenue straight to your organization. If there’s some room in your budget, create different price-level passes that offer specialties like a VIP AYCE drinks pass or a valued party favor. Incentivize your employees to drive ticket sales & award the one that sells the most. Get on social media and engage with your audience, have them promote the event with your social tag and hashtag and choose a lucky winner for free tickets. What better way to commemorate a rockin’ event than with merch sales! Everyone loves event memorabilia. At your event, have a booth or section where guests can choose from different products like t-shirts, mugs, or other items that relate to your organization. Remember those different passes? Why not have a different pass and give them a discount on some merch? Merchandise with your organization’s logo on it helps promote your businesses outside of the event. Ready to take the next step? Let the Orlando event planning experts at Fun Planners help you plan your next exciting fundraising event. Are you searching for the perfect venue for your upcoming company party or team-building activity? Believe it or not, the ideal venue may be right under your nose. Hosting a Florida corporate event in your own office space may prove to be very beneficial. Here are just some of the benefits of hosting events in-house. If you are hosting a team-building activity during the day or a company event after hours, hosting it in the office is super convenient. There is no need for employees to spend their time traveling to another venue, and it makes setup and cleanup easier. Sometimes, a venue rental can be expensive. By opting to host an event in your own office, the money saved can be spent in a different way. For example, maybe that $1,000 venue rental you didn’t purchase could be put towards a few different entertainment options for a company party that employees will truly enjoy. When the venue is super convenient, more employees are likely to attend. More attendance increases the number of people employees can meet, network with, and form friendships with. If your company hosts a successful team-building or corporate event in your own office space, positive memories are made, and then attached, to that space. When employees come to work on Monday, they might think of the fun they had with their coworkers. Hosting a corporate event in-house allows for greater flexibility in setup time and cleanup time. Also, some venues come with in-house catering requirements, so hosting in your own office space avoids this issue. If hosting a corporate party that includes family, hosting at the office invites family into their loved one’s professional life, which is a unique experience. It can also be an excellent opportunity to showcase a unique space or improvements made to the office. Overall, there are a number of benefits presented by hosting a team-building or corporate event within your own office space. Fun Planners, Florida corporate event planning experts, have many ways to spice up your office space and transform it into something unique. Contact us today to learn more! If you’re an event planner, you have probably put in months of hard work during long days. Well, what happens when the event is over, other than celebrating the joy of not having to deal with any more last minute emergencies (at least until next year)? Well, don’t celebrate too much yet, as many event planners understand the work is not yet done. Fun Planners, who work with Orlando event planners often for large Florida corporate events, team building events, and other large-scale events, has some ways you need to incorporate into your event follow-up process. Send Thank You Notes: After any type of event, it is customary to send thank you notes to any volunteers, people, event planning committees, organizations, speakers, staff, vendors, or performers. It is even better practice to hand write those notes to create a more personalized appreciation for those who helped you pull this large event off. You should have a rather large database with their contact information from the event, and you can utilize this to your advantage. Engage on Social Media: Getting feedback from the event is very important to make sure that you’re seeing an improvement in the event year over year. This is what’s going to bring you attendee retention and get you more notable and expansive in-kind donations and buzz for the next year. Social media is going to be one of the best tools for you to gather that feedback that’s going to help improve your event. In addition to gathering the feedback, keep your event attendees engaged throughout the year and excited for the event the following year. Balance Your Budget: Unless your event is for a charitable cause, you will want to see an ROI at the end of the event, and you can find this out by balancing your budget after the event concludes. Hitting your budget goals is going to determine how and if you’re going to throw an event the next year, so make your budget balancing a learning experience. 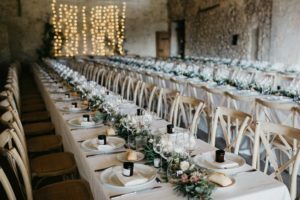 Fun Planners understands that event planners work their tail off to ensure the event goes off without a hitch, but there are definitely some follow-up items you’ll need to perform to ensure you can throw an even better event the next year. To have Fun Planners, experts in Florida corporate events, take some of the work off of your plate, contact us today for a quote.